Michael M. enjoys family time in Orlando, FL. Family vacations are rare for children who live in a pediatric nursing home. Most residents cannot speak or move independently, so it’s pretty intimidating to take them out of the building alone, never mind on a plane,” says Beth Barton, Director of Pediatrics at Radius Pediatric Center. But the benefits outweigh the challenges, she said. Vacations strengthen family bonds and broaden the horizons of the children. That’s why businessman Bill Hallisey, Jr. owner of Shiretown Glass and Home Improvement in Plymouth, MA, rallied area merchants to donate a total of $10,000 towards the first of what he hopes will be many trips. 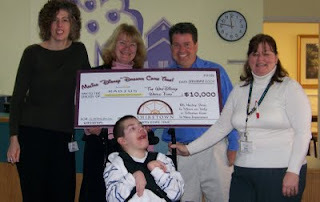 Bill Hallisey presents a check to Michael and Radius staff. “When I was younger my sisters worked at the nursing home. I used to get introduced to some of the kids and joke around and get them to smile. Through the years I would drive by and wonder what happened to those children,. . . I wanted to help them give a child the experience of a lifetime,” said Bill. 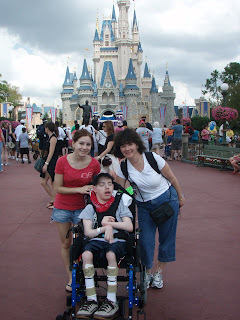 In March, Radius sent Michael M. spent his mother, sister and brother for five days in Orlando, Florida. They were accompanied by a Licensed Practical Nurse who was familiar with Michael’s needs. Radius alswo arranged for a Certified Nursing Assistant in Orlando to provide total care for Michael, who is non-ambulatory and has complex medical issues. Beth Barton observes that residents seem more alert and interactive after extended time with their families. The Schwartz Center for Children has been “helping children achieve their greatest potential” in Southeastern Massachusetts since 1947. The center operates a Special Education Day School and provides Early Intervention and Outpatient Rehabilitation Services, which include physical, occupational and speech and language therapies. It also has a certified Sensory Integration Dysfunction therapist on staff to evaluate and treat children diagnosed with autism. Located in Dartmouth, MA, the Schwartz Center also offers several specialty clinics which typically are available only in major metropolitan areas. The clinics are staffed by specialists in Orthotics and Prosthetics, Seating and Mobility, Physiatry, Genetics Testing and Counseling, and Communication Enhancement. The Center also provides high quality training and technical assistance to early childhood and special needs educators in regional Early Intervention Programs as part of the state’s Regional Consultation Program. For more information please visit http://www.schwartzcenter.org/.